Quick summary: The Worlds of Work unit connects secondary school students of all ages with life beyond school by investigating the question: “What does it take to succeed in life and work?” In this lesson, students will survey the general public to find out more about the realities of work and people’s views about success in life and work. After completing the survey challenge, students will share the range of views they heard and consider the benefits of finding information by asking other people. Finally, students will engage in a critical reflection around how they approached the challenge of speaking with people they don’t know and how the challenges they faced helped them to further develop their enterprise skills. These are transferable skills that enable young people to engage with a complex world and navigate the challenges they will inherit. They’re not just for entrepreneurs; they are skills that are required in many jobs. They have been found to be a powerful predictor of long-term job success. Who could teach this lesson? This lesson can be used with all learning areas of the Australian Curriculum, however it has been explicitly mapped to the English and Work Studies content strands. General capabilities: Literacy, ICT Capability, Critical and Creative Thinking, Personal and Social Capability. Level of teacher scaffolding: Low – facilitate student discussion. Resources required: Student Worksheet – one copy per student OR computers/tablets to access the online worksheet. Device capable of presenting a website to the class. Searching for Success survey questions print-out for each student. Butcher’s paper. Keywords: success, representation, symbol, individual. 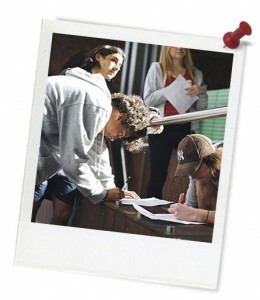 This lesson has been developed in partnership with the Foundation for Young Australians. Overarching learning goal: Students will understand the benefits of seeking information by conducting a survey. They will understand that success in life and work means different things to different people. Students will begin to think about what success means to them. What is success to others? How can I find out what other people's opinions are? Thought Starter: It is nice to be around people who think differently than you. They challenge your ideas and keep you from being complacent. 1. When you conducted your survey, you were asking about people’s views about what it takes to succeed in life and work, but that isn’t the only thing you were finding out about. In overcoming the challenge of going out and speaking with people you don’t know, facing rejection and persisting with the task (or not … ), your thinking would have changed in some way. As a result of completing this challenge, what are three things that you learned about yourself and how you respond when faced with a challenging situation? 3. Reflect on the enterprise skills you used in this lesson by filling in the table below. You can use this Enterprise Skills factsheet to support your answer.